This site is owned and maintained by the Augusta Convention and Visitors Bureau, Inc. (“ACVB”), a Georgia nonprofit corporation whose purpose is to promote tourism and conventions in, and travel to, Augusta, Georgia. To learn more about our organization please visit the About Us section of this web site. Your privacy and security are important. We collect limited personal information to provide enhanced services to our site visitors. Content and information contained in this site has been compiled by the ACVB based on data supplied by local tourism destinations, our business partners and other sources. While we endeavor to ensure the accuracy of this information, all data is subject to change without notice. Travelers are advised to contact individual businesses, organizations and destinations to verify information before traveling. This web site contains links to other sites. Please be aware that the ACVB is not responsible for the content or privacy practices of other sites. We encourage our users to be aware when they leave our site, and to read the privacy statements of each web site visited. This privacy statement applies solely to information collected by the ACVB. This site offers users the option to register to receive e-newsletters with information about news, events and special offers. Visitors to our site may also choose to complete periodic surveys that may be posted on the site from time to time. Survey responses will be used to improve our site and to strengthen our ongoing marketing efforts. Newsletter registration and participation in our surveys is completely voluntary and the user may choose whether or not to disclose any and all information. We may process data and review and site analytics about your use of our website and services ("usage data"). The usage data may include (your IP address, geographical location, browser type and version, operating system, referral source, length of visit, page views and website navigation paths, as well as information about the timing, frequency and pattern of your service use). The source of the usage data is Google Analytics. This usage data may be processed for the purposes of analyzing the use of the website and services. The legal basis for this processing is to fully know our site visitors in order to make our online presence rich in resources that our users want. While the analytics are reviewed internally by the ACVB staff and board of directors, we do not share analytics publicly. We may process your account data on social media and via our web e-newsletter. The account data may include your name, social media account and/or email address. The source of the account data is ACVB. The account data may be processed for the purposes of operating our website, providing our services, ensuring the security of our website and services, maintaining back-ups of our databases and communicating with you. The legal basis for this processing is our legitimate interest, namely the proper administration of our website. We may process information that you post for publication on our website or through our social media services ("publication data"). 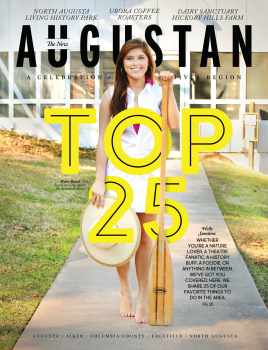 The publication data may be processed in order to show our web and social media users about the Augusta experience. The legal basis for this processing is our legitimate interest, namely promoting the local area through the eyes of social media and blog posts that are set as public viewing. Source(s) will always be cited when content from a third-party is used. We may process information that you provide to us for the purpose of subscribing to our email notifications and/or newsletters ("notification data"). We will not share your information with others and you may unsubscribe at any time. *Portions of the above policy were used from a template from SEQ Legal, LLP. A cookie is a piece of data stored on the user&apos;s hard drive containing information about the user. Any usage of cookies by us is in no way linked to any personally identifiable information while on our site. Cookies enable us to track and target the interests of our users to enhance the experience on our site.